There are very few Americans since our great country's birth who have done so much out of love and pride of the USA than Ronald Reagan. Considered as one of our greatest Presidents (1981-1989), Ronald Reagan personified representing "We the People" without concern for personal gain. America . . . as our freedom and way of life always came first. And while Ronald Reagan contributed so much to the USA, there is no better way to salute him as a Great American Patriot than in the words of leaders and fellow Americans...President George W. Bush ... "Ronald Reagan won America's respect with his greatness, and won its love with his goodness. He had the confidence that comes with conviction, the strength that comes with character, the grace that comes with humility, and the humor that comes with wisdom." President Bill Clinton ... "Hillary and I will always remember President Ronald Reagan for the way he personified the indomitable optimism of the American people, and for keeping America at the forefront of the fight for freedom for people everywhere. It is fitting that a piece of the Berlin Wall adorns the Ronald Reagan Building in Washington." President George H. Bush ... "Our friend was strong and gentle. Once he called America hopeful, big-hearted, idealistic, daring, decent and fair . . . Ronald Reagan was beloved because of what he believed. He believed in America so he made it his shining city on a hill . . . He believed in freedom so he acted on behalf of its values and ideals. He believed in tomorrow so the great communicator became the great liberator. " President Gerald Ford ... "Ronald Reagan was an excellent leader of our nation during challenging times at home and abroad." 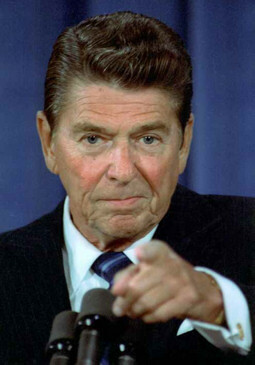 Vincent Forras ... "Ronald Reagan's success on every level illustrates a leader with class, dignity, strength, patriotism, humility and of all things CHARACTER AND HONOR . . . It was Reagan's vision of the shining city on top of the mountain that captured the imagination and patriotism of our great country. He is the first president that I wrote directly to, inspired by his actions and the birth of my first child, Michael who is now a serving Marine . . . Whenever I think of President Reagan I get a chill, a feeling of pride and ultimately a tear at the loss of this great American. The fall of the Soviet Union, the reuniting of east and western Europe, his standing up to the Iranians literally in his first minutes of his first term, Challenger Disaster as he made his brilliant and moving speech, standing up to the terrorists in Libya and so much more! His words were simple, elegant and welcomed always . . . The love I feel for this man is as a father, as a leader and as someone who should absolutely appear in my lifetime on Mount Rushmore." Joseph Decker ... "He was a president that cared and supported the American people and their nation . . . his love of country and its people cannot be denied . . . someday I would like to see his face chiseled in stone at Mount Rushmore." Matt Fitzgibbons ... "Ronald Reagan once said, 'The most terrifying words in the English language are: I'm from the government and I'm here to help.' What else is there to say? This is the belief of our founding fathers… what United States were founded on… what made this Republic great." 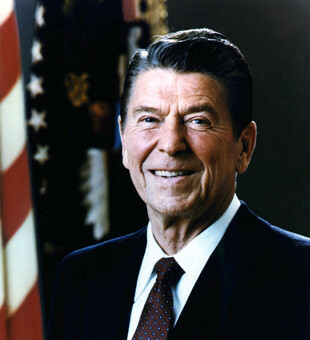 Alexandra Reed Lajoux ... "Ronald Reagan, as Commander in Chief of the United States of America was a president who could inspire all people, whatever their political affiliation . . . The lanky actor and union organizer turned visionary leader burst onto the national scene late in the 1970s just when America was tiring of being defeated and humiliated. Images of American captives being blindfolded and mocked showed on the nightly news. America had just celebrated its 200th birthday and the irony seemed too hard to bear . . . A humble man, he knew he had to achieve the dignity incumbent on the Oval Office. And he did. His earliest theme was “Sunrise in America” and with his reasonable yet warm approach to our issues, he became our “sun” . . . In all his words and actions Ronald Reagan had one core message: I love America. He loved our founding values. He loved our potential to grow beyond them by being more inclusive. He loved our capacity to work, to take responsibility, to admit when we were wrong but to also stand up and be counted when we were not to blame and instead needed to make a mark. He loved our warriors past and present: men and women in uniform ready to fight tyranny and torture courageously on air, land, and sea . . . He disdained traditional barriers of gender and race, appointing new faces to the cabinet and to the land's highest court. 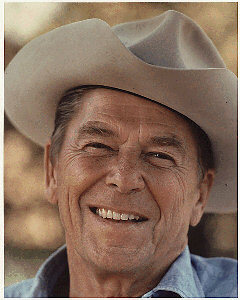 . . Rest in peace Ronald Reagan. May perpetual light shine on you, now and forever." David G. Bancroft, founder of USA Patriotism! 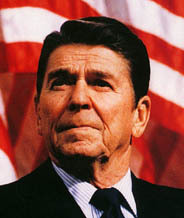 ... "Ronald Reagan epitomizes the best in American leadership . . . and putting country above oneself for freedom's sake and the good of all Americans. He should remain a shinning light of inspiration for today's generations and those yet to come."